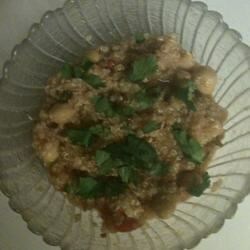 This delicious recipe was presented to me by a vegan friend. 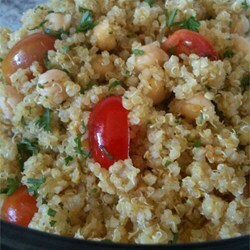 The lime juice gives the quinoa a fresh flavor that can’t be beat! 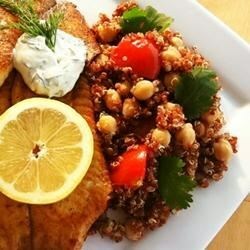 Place the quinoa in a fine mesh strainer, and rinse under cold, running water until the water no longer foams. Bring the quinoa, salt, and water to a boil in a saucepan. 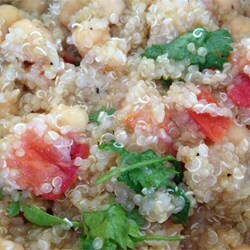 Reduce heat to medium-low, cover, and simmer until the quinoa is tender, 20 to 25 minutes. Once done, stir in the garbanzo beans, tomatoes, garlic, lime juice, and olive oil. Season with cumin, salt, and pepper. Sprinkle with chopped fresh parsley to serve.